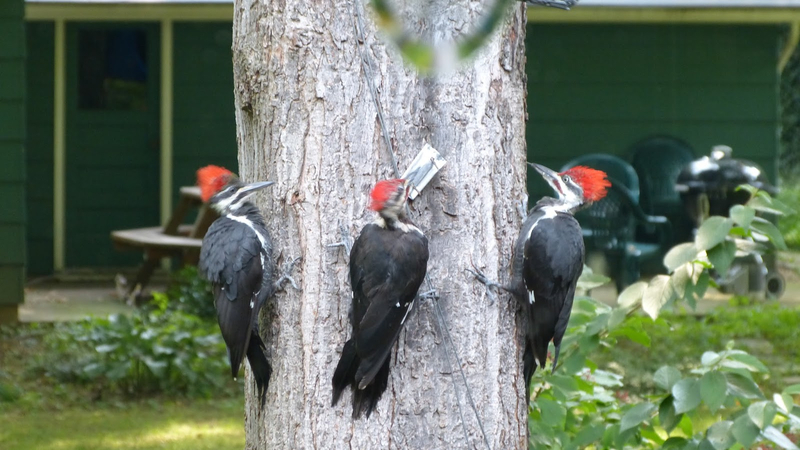 While visiting my brother and his wife this summer in East Aurora, New York, we experienced a truly wonderful and unexpected visit from three pileated woodpeckers at the suet feeder Jim had filled. His wife, Paulett, said the woodpeckers were frequent visitors to their lovely back garden. This was a first for me. Although I’ve been an on again, off again birdwatcher for most of my adult life, I’ve only seen one pileated woodpecker in person before. Seeing three at the same time was simply brilliant. Watching their acrobatics as they fed on the suet, flew back and forth to peck at a tree, and generally manoeuvered their rather large bodies in amazinglying agile ways was pure delight. After a feeding frenzy, they flew away and it felt amazingly still and empty where they had been. Much like a visit with beloved family and friends, the ‘after’ part comes all too soon and leaves a void in our hearts. This poem is dedicated to Jim and Paulett, two of the kindest and most caring people I know. Thank you for sharing your home, your family and your amazing woodpeckers with us. Comes to a languorous close. Then shifting to soft silky suet. And mother dutifully give way. Flash like stop lights in the early evening sun. As we watch in these avian acrobatics. The richness of what the day has given. Knowing that summer will end all too soon. 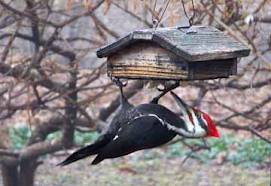 This entry was posted in Mary Kendall poetry, meditative poem, memories, Nature, nature poem, Poems, poetry, seasons, Time and tagged closeness, family, Mary Kendall, memory, nature, Pileated woodpeckers, poetry, sharing. Bookmark the permalink. So beautiful Aunt Mary! Makes you realize it’s the the little things in life that make us smile! So very true, Paula. Reconnecting with all of you and your family was a truly wonderful thing to happen. So beautiful Aunt Mary. . . makes you realize it’s the simple things in life that make us smile! tell you we have a woodpecker here in Florida in the preserve behind us waiting to perform for you here when you come down. I’m glad you both liked the poem. I took a bit of poetic license as you can see, but I think it paid off. I will never forget those beautiful birds or all the time we spent together. Love you. 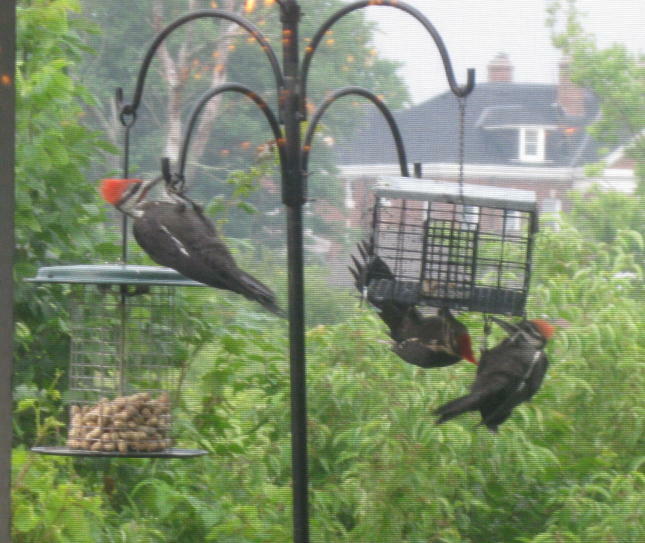 Several years back we were fortunate enough to host numerous pairs of red headed wood peckers till a tornado blew their tree over. Thank Goodness. They were gone at the time. I think I’ve seen a pair scouting this year.